Altus is home to Altus Air Force Base, the United States Air Force training base for C-17, KC-46 and KC-135 aircrews. It is also home to Western Oklahoma State College and Southwest Technology Center. U.S. Routes 62 and 283 cross in the center of Altus. US 62 leads east 73 miles (117 km) to Lawton, Oklahoma, and west 66 miles (106 km) to Childress, Texas, while US 283 leads north 23 miles (37 km) to Mangum, Oklahoma, and south 34 miles (55 km) to Vernon, Texas. Autumn is brief, with generally very warm afternoons and comfortably cool mornings, while winter is extremely variable. Chinook winds can sometimes raise temperatures to uncomfortably hot even in the low winter sun, in the process often drying out vegetation to produce wildfires. On the other hand, if a block forms over the Gulf of Alaska very cold air can be driven into the Plains States from Canada, producing temperatures below 0 °F or −17.8 °C in extreme cases. Such cold temperatures on average occur once every three winters, although on average 78.5 mornings each year fall to or below the freezing point. Snowfall is rare and erratic: the most in a months being 16.1 inches (0.41 m) in January 1966, while most rainfall comes during the unsettled spring season, when heavy thunderstorms can occur from the convergence of hot and cold air masses to produce very intense short-period rainfall. The wettest month has been May 1980 with 13.34 inches (338.8 mm), whilst zero precipitation has on occasion been recorded in every month except May and June, and the wettest 24 hour period on October 20, 1983 with 7.10 inches (180.3 mm). The wettest calendar year has been 1941 with 49.30 inches (1,252.2 mm) and the driest 1970 with 10.42 inches (264.7 mm). As of the census of 2010, there were 19,813 people residing in the city. The population density was 1,200 people per square mile (450/km²). There were 8,890 housing units at an average density of 540 per square mile (205/km²). The racial makeup of the city was 72.62% White, 10.41% African American, 1.48% Native American, 1.38% Asian, 0.20% Pacific Islander, 10.32% from other races, and 3.59% from two or more races. Hispanic or Latino of any race were 17.25% of the population. In the city, the population was spread out with 29.8% under the age of 18, 11.0% from 18 to 24, 29.8% from 25 to 44, 17.9% from 45 to 64, and 11.5% who were 65 years of age or older. The median age was 32 years. For every 100 females, there were 98.9 males. For every 100 females age 18 and over, there were 94.1 males. The public schools of Altus are in Oklahoma School District number 18. In the Altus Public School District there are nine schools, including five elementary schools, an intermediate school, a junior high school, a high school, and a learning center. For the 2011-2012 school year there were approximately 3,851 students. The school website is http://www.altusschools.k12.ok.us/district/. 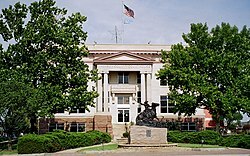 ^ "The City of Altus Oklahoma". City of Altus. Retrieved October 16, 2018. ^ a b c d e "Geographic Identifiers: 2010 Census Summary File 1 (G001): Altus city, Oklahoma". American Factfinder. U.S. Census Bureau. Retrieved October 16, 2018. ^ "CensusViewer:Altus, Oklahoma Population." Retrieved January 16, 2014. ^ a b c d Herron, Frances (2009). "Altus". Encyclopedia of Oklahoma History and Culture (online ed.). Oklahoma Historical Society. Retrieved January 16, 2014. ^ a b c d Reconnaissance Level Survey of Certain Parts of the City of Altus (PDF) (Report). Oklahoma Historical Society. 1993. Retrieved May 10, 2010. ^ Hofsommer, Donovan L. (June 15, 2010). "Wichita Falls and Northwestern Railway". Handbook of Texas Online. Texas State Historical Association. Retrieved April 21, 2013. ^ "Record Highest Temperatures by State (through 2003)" (PDF). NOAA.gov. NOAA. Retrieved January 31, 2012. ^ "Seasonal Temperature and Precipitation Information". Western Regional Climate Center. Retrieved November 24, 2013. ^ "Altus Parks | Altus, OK". www.altusok.gov. Retrieved 2018-10-04. ^ "Splash pad to make a splash in Altus | Altus Times". Altus Times. 2018-05-05. Archived from the original on 2018-10-04. Retrieved 2018-10-04. ^ "Senior Activity Center opens | Altus Times". Altus Times. 2018-05-08. Archived from the original on 2018-10-04. Retrieved 2018-10-04. ^ "Altus Public Schools". Altus Public Schools. Retrieved 2012-03-06.